What does all this rain mean for your citrus trees? 2.20.17 -Is this stormy weather bogging your citrus trees down? Find out more in this post from Sam Royall, our wonderful Volunteer Program Assistant from Occidental College. As you may have noticed from LA’s lush and uncharacteristically green mountainsides, we are in the midst of one of California’s rainiest winters in recent history! And while this has probably allowed you to slip-on a rare pair of rainboots and splash around, have you wondered how these storms have been impacting your citrus trees? Grab a cup of tea, play your favorite rainy day song, and learn a bit about how to best care for your citrus trees in this blustery weather! Depending on the age of your tree and the composition of your soil, citrus trees require varying amounts of water, ranging from a good soak every 7 to 28 days. This rain has probably drenched the your trees’ roots, but do you know if they’re being over watered? Check-out these signs of overwatered citrus to figure out when to give your citrus tree its next soak! 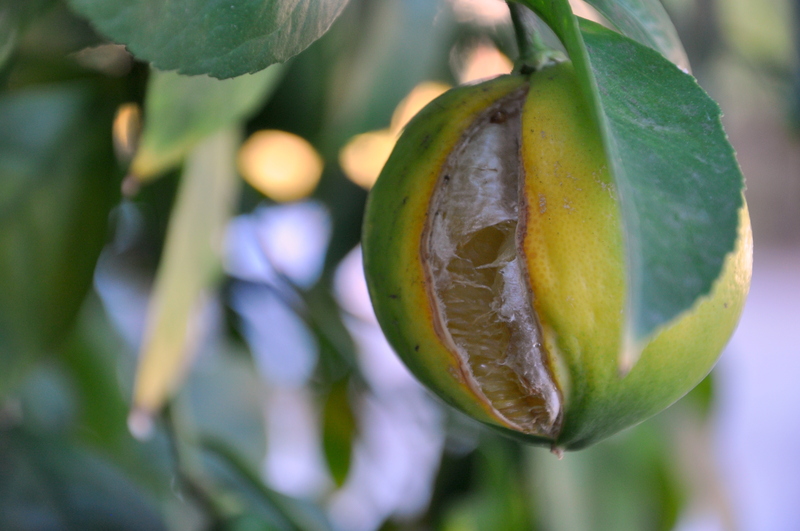 If you notice any of these signs in your citrus trees, check to make sure that the soil around your tree is draining, and then take a break from manual watering for a few days or weeks depending on the severity of these symptoms. Keep checking the moisture of the soil around your tree, but don’t worry! All of this water will make your fruit even bigger and juicier than ever! This entry was posted in Fruit Tree Care. Bookmark the permalink. Thank you. I think I have this problem. This is the only site that mentions this.